The overall objective of the SRWA Water Quality Monitoring Program is to establish at least a four-year baseline of water quality on the streams and rivers within our service area. The baseline data will be used to determine the overall health of watersheds and troubled spots will be investigated. 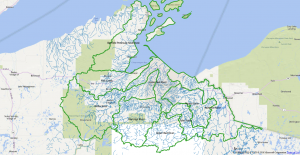 The Superior Rivers Watershed Association and other data users can then make more informed decisions on supporting proposals concerning land use, conservation efforts and other projects to preserve the vital habitat and water quality of the watersheds. Continual monitoring should then be able to detect changes to water quality in the future. There are two main sub-objectives to the Superior Rivers Monitoring Plan. Objective 1 – to collect baseline data on several points of the major tributaries. Data to be collected consists of basic water chemistry (temperature, pH, dissolved oxygen, chloride and turbidity), biological assessment using macroinvertebrates, and physical characteristics. Objective 2 – to get local citizens involved with their watershed by monitoring water quality. The plan is built to meet these objectives and originally to extend the sampling being carried out by the Bad River Natural Resources Department (BRNRD). As the organization expanded work throughout the region, these objectives were carried into the new reaches. The major subwatersheds are sampled at several possible locations on the major tributary – headwaters, mid-length and near its mouth. This plan enables the capture of minimal water quality data. As the program expands and volunteers are added, more sites are added. The sampling sites have been chosen according to the information the site can give about the watershed (headwaters, below confluences, upstream/downstream of possible sites of impact) and the possibility of safe convenient access for the volunteers. 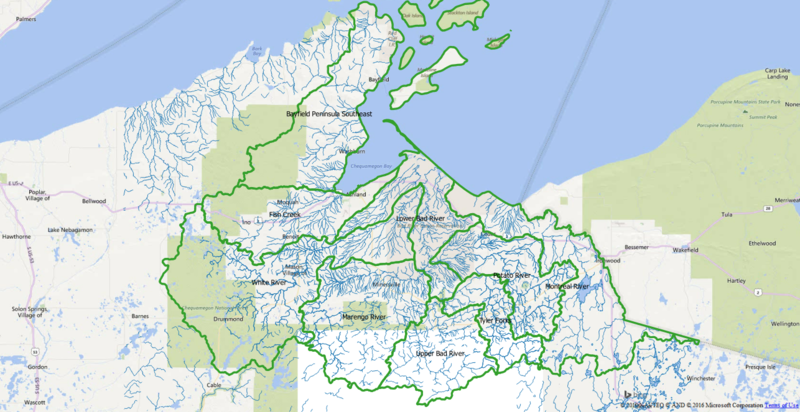 An important example of our water quality data in use occurred in October 2006, when the Wisconsin Department of Natural Resources (WDNR) approved the designation of 44 northern stream segments as Exceptional Resource Waters (ERW) or Outstanding Resource Waters (ORW). Originally, streams in the Bad River watershed were not considered for these designations due to lack of information. Our macroinvertebrate sample data was submitted to WDNR to demonstrate that many of the waters we sample deserve this special designation. As a result, several rivers in the watershed were added to the ORW/ERW list. For more information on ORW/ERW waters in the Bad River Watershed, CLICK HERE. The Superior Rivers Watershed Association’s (SRWA) Data-sharing Policy is designed to make data from the SRWA database as freely available as possible for academic, research, education, and other professional purposes. Our goal is to promote the use of the best available information to make informed decisions. In this spirit, SRWA has developed a formal request procedure to allow our data to be shared in a way that is fair and appropriate.